Becoming a mother hasn’t changed who I feel I am as much as it’s changed where I feel I am. The expansiveness of this world courses through my veins and as a mother I sense being rooted to this earth in a new way. I feel safer, experiencing how life enters this realm seems to lessen my own anxiety of this journey. Witnessing both the vulnerability and fierce nature of a molding spirit, I understand my memories more and can process the energies of those around me in new ways. I’m more quick to both forgive and move on, knowing the journeys we are all on in this shared existence seal us together beyond physical or emotional interaction. I’m still the same me, and as I love these tiny humans more, I am loving myself more. Picture taken by my husband on our first road trip as a family of 4. Three and a half weeks of adventure, struggle and miracles. The trip started with me leading a teacher training in St Louis — a prenatal program that was simultaneously the worst and best time I have had leading. It was a huge learning experience for me. Testing the waters of traveling and teaching with littles, everything has different costs and benefits. At the end of this program I’m so clear that I need to start all of my working relationships with a disclaimer. Warning! I am a mother. I have two children that still fit on my hips. At any point in time, I may pause what we are doing and tend to their needs, as it’s like we share the same air, and while we may go off and swim in different directions, when we need to refill we do. Note, Judah’s tiny lungs don’t last long. And when I come back, I will breathe new life. Judah, Judaea, Judy, Jooddle, Jude. I must call you twelve names in a day, because you represent so many unique and deep sources of love for me. To all of these names you respond with a huge smile, and I’ve never met someone so generous as you with your joy. Thank you for coming into this family. While it pains me that we drove you across country at 10mo, your head bobbling away for hours on end, I know you signed up for this fun when you picked me to be your mom. And we did this with Indra at 3mo (through snow covered mountains — what??). So we are a little less crazy with you. Still crazy. And I think the above disclaimer will help me to navigate my working relationships more effectively going forward. This trip wasn’t unsuccessful in that by any means, but it did shed new light for me around what I need to create. I’m only interested in this teaching gig if it means I can say I was with my kids when they needed me and they were welcome everywhere I went. This is my norm and we have many more years of yoga circles and community. A dear teacher friend (who joined the STL program) chuckles at the ideal of Indra one day realizing his childhood was not the norm — not every kid played with plastic water bellies and sang Sita Ram while mom taught yoga? So after the program, the second leg of our travels was east to the Carolinas. This was a last-minute decision preceded by years of anticipation. Michael’s mom was born into a huge (to me) tight-knit country family in the foothills of the Asheville mountains. She’s been gone for over 15 years and while I haven’t met her in human form, I have felt very connected to her and looked forward to meeting this side of Mike’s family. I allowed myself to feel fully welcomed and accepted, something new to me and also made possible by country hospitality and regular affirmation from his family. I also arrived in my hairline, which never hurts. It was incredibly beautiful and soul-filling. It’s a special place and I look forward to going back regularly. I can feel the buzz of the earth, the tremble of this floating ball beneath my feet, ready to burst with beautiful blossoms and begin again. And then there’s the voice.. slow down, rest, be patience. Don’t rush life. This moment is so precious. We are preparing to move the studio >> saying hello to a beautiful new spot off the square. A few blocks from my house and I can’t help but grin ear to ear over when I speak of it. I have a 4mo old (Today! Happy first quarter, Jude, my love) and a closer-to 3yo every day (Indra, you are exploding with life) that my heart aches to give everything to. My husband is delving deep into music and expression in new ways and I so want to support him through this in all the ways I can. The current 200hr and 300hr Trainee’s are amazing. If y’all are reading this, you’re blowing my mind with hope and love for our future. And then there’s the Prenatal program coming.. So much excitement. So much to come. And I want to be here. And experience this. I want to rest and and heal from my birth, which is happening more each day and night. As Jude sleeps deeply I feel my body sinking into a next level of rejuvenation. It needs me to relax. It needs me to release. The spring will come. I couldn’t stop it even if I wanted to. Be here now, my dear sweet Alexandria. Written from my future self to me, today. 2017 will always be the year we welcomed Jude Oso Pulfer. It took me many months (and possibly years..) to process the birth of my first beautiful son Indra. I love thinking about how my understandings of birth and the telling of my experiences will evolve over time. When Jude was born, I labored physically alone for the majority of it and never felt a shed of loneliness. This was something he and I did together. Dilation began the evening before and after updating my midwife, we attempted a night of sleep. We were all successful and all rested a fantastically full night. I will always remember the feeling of opening my eyes the next morning.. Motionless and waiting to see if a contraction would come.. It did. I was 3-4cm at this point and active labor began with a sense of wonder. I lit candles, chanted and created a contained nest for myself for many hours. The rushes that built and ceased were steady yet peaceful and I experienced presence throughout. My midwife saw me regularly and left, at my request. I felt very tuned to my body and able to both speed up and slow the process as I desired. I wanted our babe to join us after Indra’s midday nap, so I patiently waited and took my time with the labor through breath and stillness. I asked our dear photographer friend (it was also her birthday too!) to arrive at 2pm. Indra woke up just after her arrival and Jude was born just before 3pm. The photo below was snapped minutes before Jude’s birth. A couple times earlier that day, Michael walked through the room and would say, “Whoa this time is so different! It’s crazy!” It was different. They can’t even be compared. And Jude’s birth was very peaceful and soft. The transition (when the babe travels out through the birth canal) was the most challenging turn. I am grateful for the gigantic feat that birth is and the way it finds me forcibly humbled. Without it, I know it would be nearly impossible to respect the importance of remaining in a state of rest. Which is likely my most proud piece of the puzzle that formed this birth.. The bonding, the bathing, the herbs and the treats that followed his birthday are such sense inducing memories. I don’t think I’ll ever eat a date again without remembering my first 40 days of life with Jude. 2017 as a family of four means a rich journey of parenting and co-piloting life with my Michael. New Years Eve is our wedding anniversary and while challenges me more every day (I think we had our biggest parenting disagreement yet earlier..) I am more confident and trusting of our roles and love every minute. Grateful to be the mama of your sons, Babe. As I melt into the magic that was my year of a blissful birth, I find myself with a sense of limitlessness. Anything is possible and I am rich with that same sense of wonder.. what will happen? Where will this life take me? Ready and willing to flow with it and delighted to dive deep and dig in. Multiple times last week I said something along the lines of “I am recovering” from my blessingway. At one point a dear friend said, “I hope you never recover from that!”. And from there I was able to shift, into a space of claiming a new level of confidence and acceptance of love. Out of reaction and into creation with the beauty I was gifted. There are many impactful activities and functions that can be planned for celebrating a mom to be — showers, parties, etc. What makes events like these special to me is the quality of interactions and the level of intention beyond the purpose of gathering. Once people arrive, once all the fancy decor is completed and the delicious food set, then what? When these woman folk first trickled into the house there was pure giddiness in the air. I laughed so much. Amanda braided my hair, others massages me, brought me drinks and treats and were just generally playful and excited. 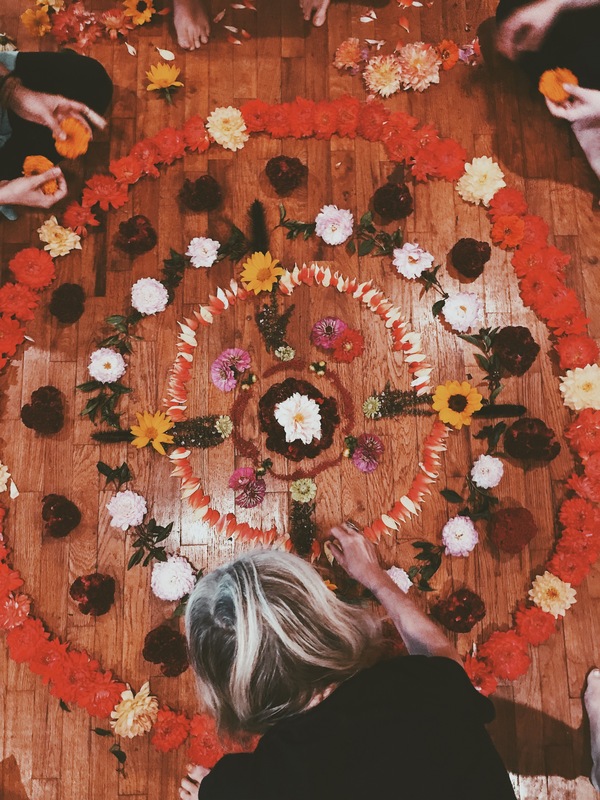 A few of the girls began making a beautiful mandala from a carload of flowers from Dripping Springs. They worked steadily and efficiently together. As I became more grounded and allowed myself to ease into what was happening, I felt the room do the same. 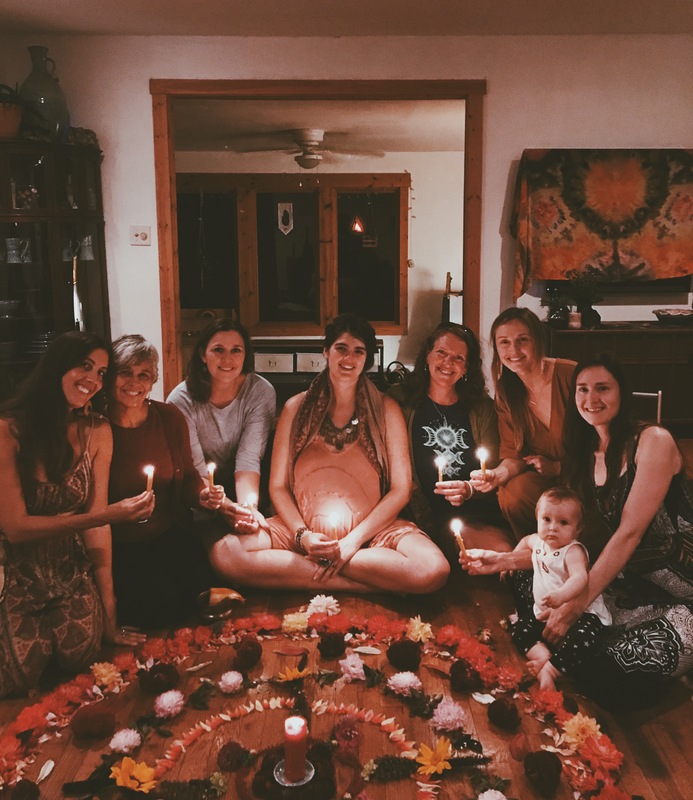 Intentional meditations and discussing my plans for the birth contributed to a next level of presence for me within the group. These were all women that I love and adore, who have played such a significant role in my life over the past few years of my transition to motherhood, to have their presence together in my honor was a blessing in itself. Of course, the words and connections took that much deeper. 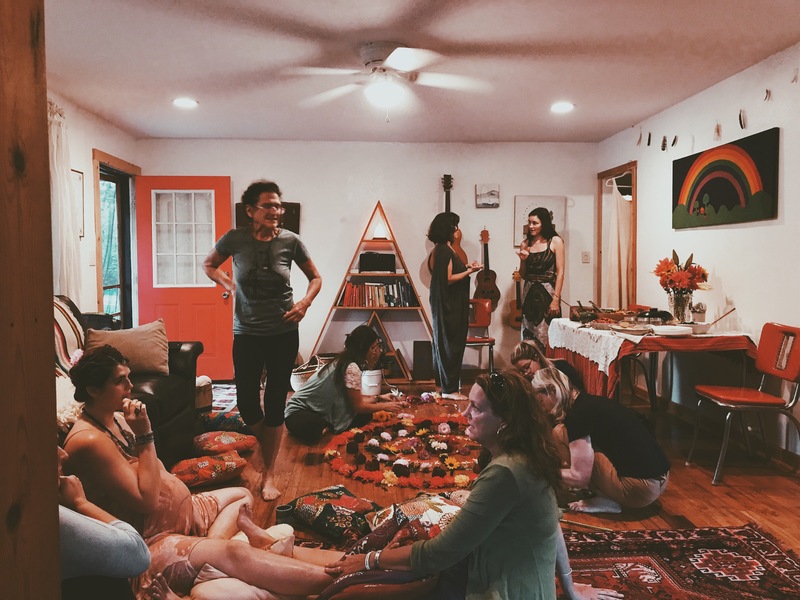 After nourishing food and beautiful conversation, the energy of the room continued to ground as we moved toward a sacred circle. Quite a few had to leave to be with their families; they offered their kind goodbyes together with the group, and after a container was held with candles and ceremony. Prayers, chants and deep shares commenced. My cup was filled over and over again with the beautiful words that came from the mouths of my friends. Speaking about our relationships, of birthing, of mothering, of challenges and inspirations. I am so grateful for the heartfelt and honest sharing that was offered in that space. I still found myself at times closing my heart, almost as if it were too much to bare. And after, my story of “recovering” was absolutely a reflection of me shying away from the experience. Why can powerful love be so hard to take? This is not what I consciously chose. I chose to love and be loved beyond my capacity for it in this moment. I chose to accept the boundless love that my children, my family and my friends contribute to my life in each moment. And to return it in more ways than I even know. I chose to find new ways to open, to give and to recieve. 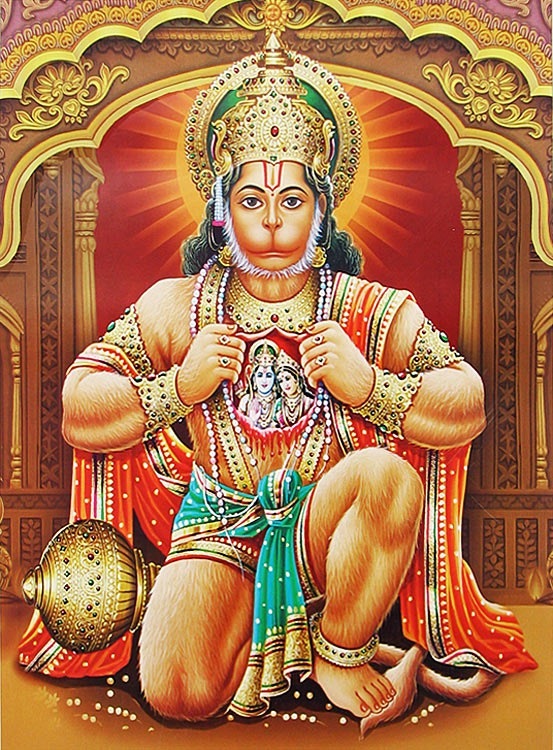 I have been loving this visualization of Hanuman opening his heart. There’s a sweet story about him holding his chest open to show his devotion. His passionate love is known to provide him with super-human powers, the ability to literally move mountains. As much as I set my mental and spiritual intentions to open to love, I know there’s little I’ll be able to control with this upcoming birth. My heart is about to open further in more ways than I can imagine, of that I am sure. May you feel the love around you today and trust that the more you open, the more you receive. The Sunday chant, to warm your heart, on this crisp October morning. When I catch a moment of the fall breeze brushing against my skin, a tiny ping of fear creeps up the back of my neck. Cool weather means a baby is coming. Soon to expel his or herself from my womb and into this world.. I am confident, secure and above all trusting. And I know this upcoming process requires the deepest kind of surrender; physically, mentally and spiritually. My biggest preparation for this birth is centered around family. The first time around I was becoming a mother, a birth in itself. This time I am a mother welcoming a new soul into our home. It feels wonderful. I have told many how much easier this pregnancy has been. Watching not to say these things in front of Indra; he is always listening and I am looking to avoid comparison. The two pregnancies are completely different journeys. And experience makes a world of difference. Both my body and my mind understand so much more now. This fall has already brought a beautiful grounding rhythm into our daily lives. A summer filled with spontaneous river trips and late night adventures with friends has come to an end. I am so loving this time of shifting to reflect on abundance, harvest what has been created and move toward rest and renewal. 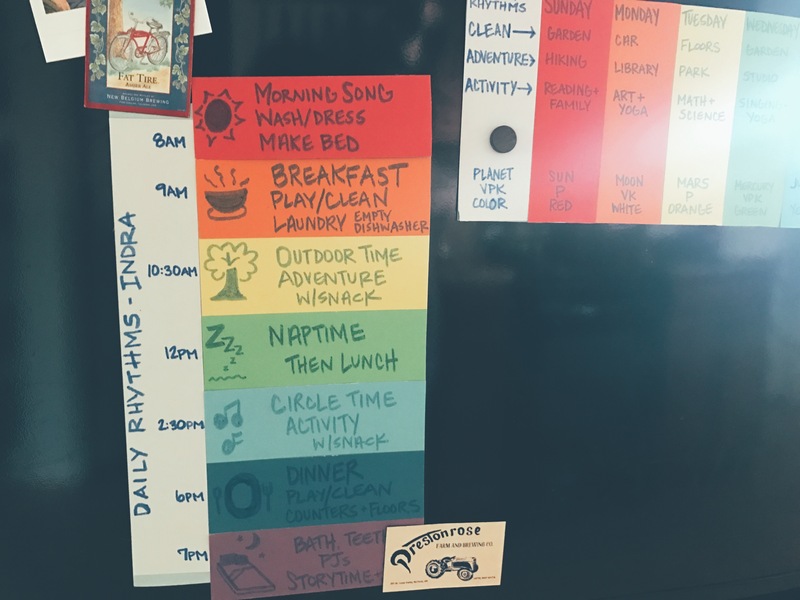 One of our favorite family tools is our daily and weekly rhythms sheets. Pictured below, this snapshot tells Indra what key things we complete every day and in what order. He adores it. He doesn’t always want to brush teeth, but this sheet makes it possible to offer him consistency and awareness. It also gives me more confidence that as I transition to bonding and healing stage with this second child, Indra will have stability in his daily routines. For now I am spending every moment I can enjoying the end of this chapter — the past three years have been the most amazing of my life yet. Welcoming Indra to Earth with Michael has been such an honor. My reflections turn into sobs at this point. While it feels hard to say goodbye to this current life, I know the next level only has more amazing things in store. Add in a week of Kitchari, Abyhanga (self-massage) and home/nesting projects and this fall is off to a great start. 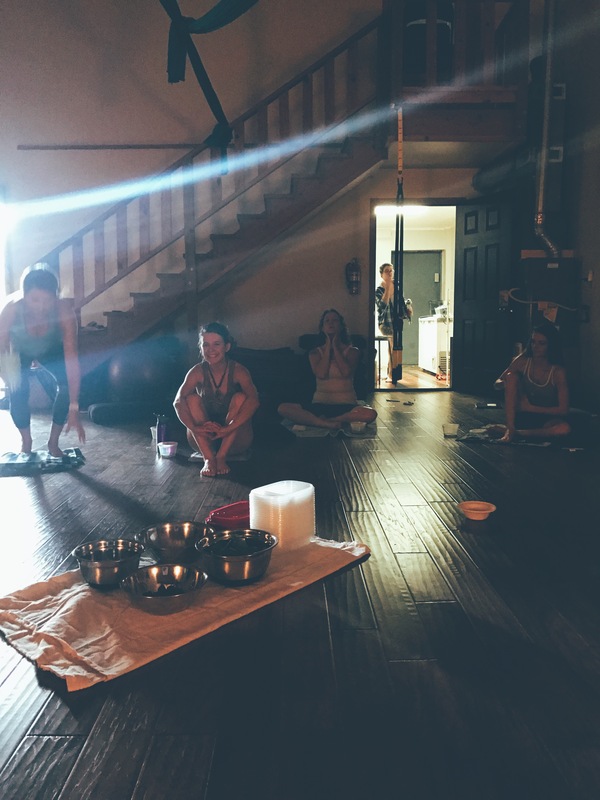 I had the pleasure of sharing my favorite elements of an Ayurvedic lifestyle with our 300hr Advanced YTT group last week. It has been such a pleasure working with a powerful group of amazing women. Deeply nourishing and I can’t wait to share more as our program unfolds. Ready when you are, baby. You’re coming into a beautiful community full of love, light and possibility. Started in my lips, finished in my clitorus. 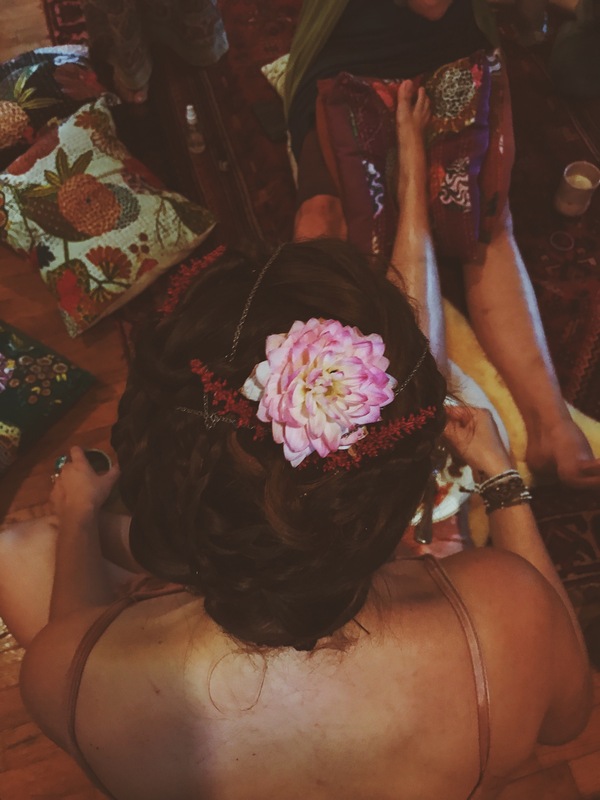 It’s tough for me to post this as in many ways it feels so incomplete, so personal and there are many more things I’d like to say about trauma, yoga therapy, etc. And this blog is about the personal process for me, looking to share what’s going on for me as a means to empower others, so here it goes. I stood on the hot sidewalk and watched the events unfolding at my home from a distance. I didn’t want to go closer. Paramedics and police officers went in and out while blue lights flashed across the house. I remember thinking “This is it. You aren’t going to survive this.” In whatever language my toddler mind could process at that point; I didn’t think I was going to live much longer. The cycles of abuse around me continued to grow stronger by day. The trash can was an indication of what lie ahead. Empty glass bottles on top meant physical pain would trickle down to me later. Later that night, from the walls of a women’s shelter, I felt frozen in pure terror of what would lie ahead. All my little mind could process was you are not safe, you have no where else to go. Memories like these are visceral ones I find myself working to uncover as a means to heal. In yoga, to experience Vidya, right perception, rather than the afflictions of an unsteady mind. The details aren’t pretty, and as Indra approaches the ages I was where my most formative memories of physical abuse began, I find myself reliving many things from my past. Not as a victim, rather as an active participant in the process. To me it’s work of acknowledging my feelings exactly as they were and where they are today, free from judgment. My dream world is my main indication of progress. The Yoga Sutras offer that meditating on dreams can produce a new level of stability of the mind. The idea is that our experiences in dreams are most reflective of our inner states, as they are free from outer world senses and influences. Last night I dreamt that Richard, my former step-dad, was standing outside our porch. It was raining. He hid in the dark. He was drunk, aggressively shouting things to Michael when confronted by him. While I stood in the house, my initial caution was supported by an overall experience of confidence that we were safe. That is the part that tells me I’m making progress. Those who work with me know how much I emphasize the process of uncovering memories from the past. As a Yoga Therapist, I am frequently referring people to work with Mental Health Therapists through the uncovering of (big T) Trauma. At the same time, the process of Yoga Therapy can be invaluable throughout these stages of healing. In Ayurveda, the manas “mind” channels live in both the mind and the body. While Western treatments work to repair and optimize the functioning of the brain process, Eastern offerings tap into the innate intellect of the body. The patterns we hold all through the physical (anamayakosha), energetic (pranamayakosha) and mental (manamayakosha) all contribute to our experience of reality today. While many parts of my brain wish I could say the shelter was a turning point, there would be many more memories formed of flashing blue lights against many different homes, even after Richard was gone. He ended up killing himself later in life. I can only imagine the depths of his internal conflictions. By the age of 17, I had moved more than 20 times. So I went out on my own as soon as I could and a few years later I purchased my own home (still owned and one of my most beloved places in the world). The sounds of breaking glass, screaming, and eventually the tone of the dial as my fingers pressed against 9-1-1 are all pieces of memories that have helped make me who I am today. These cycles of experiences have contributed to my individual strength and perseverance in more ways that I can likely see. While sometimes challenging to embrace, new energy resources, ease of daily life, depth of connection, these are the things that keep me on the path of unveiling and revisiting the things that have happened and what I made them mean about me and my life. All of my relationships today depend on my continuous evolution. If they don’t, then they aren’t moving me forward. I spent many years trying to forget the things of the past. So much so that I disillusioned myself to reality. Many of my filters caused me to act more like a child and experience more pain. While I still find myself throwing the occasional adult tantrum, I’m getting better. My daily mind and life are more peaceful than they have ever been. Do you feel like a better person than you did a year ago? 5 years ago? I say keep on, keepin on then. You’re doing a great job. Written from my eyebrows on a steamy August afternoon with a growing belly! >>Wondering what a map is and why you would even need it? Go here. 1. Be patience with yourself. Trust in your process and it will lead you to the quickest, most in-tune results. 2. You have the answers within. When in doubt, ask yourself and listen to the response. 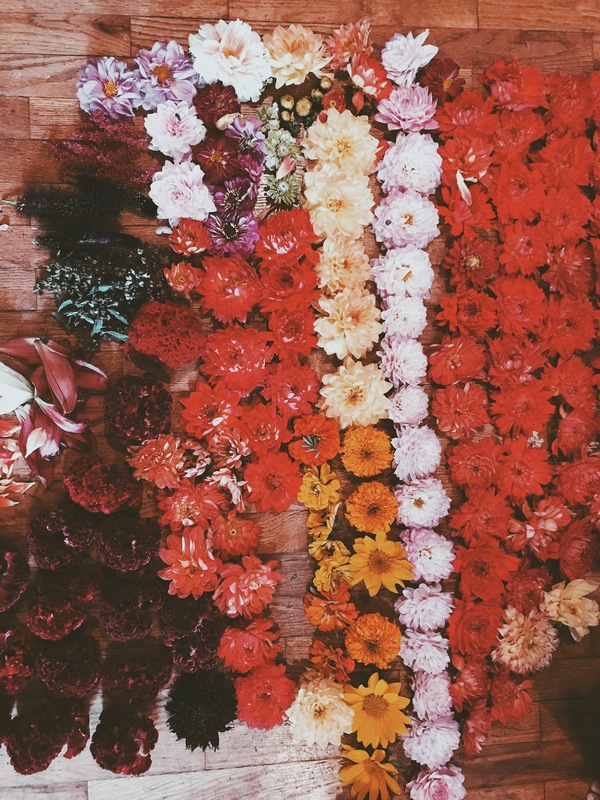 Some women I know have been able to simply journal over a 28.5 day cycle and feel very clear by the end of it that they can map their own centers. If you are someone who has an honest dialogue between a pen and your mind this may be a beautiful way to create. I recommend writing down all Eleven Moon Centers down on a piece of paper, seated in a easeful position close to the earth and making sure all your basic needs are met (food, water, intimacy, sleep and temp). Take your pendulum and find a clear yes and a clear no. Then begin by asking “am I in my ___ today?” Lips, for example, and go through each of the centers in the order that calls out to you until you get a clear YES. Note, there may be times in which you get a yes more than once, meaning you are in a transitionary period. Look then for morning or night, dusk or dawn, finding the times in which you are transitioning from one center to another. Then you will find yourself going through the list, taking notes on your own map. You can ask things like “Yesterday I was in..” or “Tomorrow I will be in..” or “After my Thighs in am in my..”. Keep going until you can confirm an order. If you get confused or frustrated, pause, breath and read points one and two again. Training in energy work enables a greater understanding of this process as does a traditional Yoga practice. Your body is always a well of information, including a clear yes and no to your subtle body field. It is quite possible to muscle test yourself to find your Eleven Moon Center map, as well as have someone else do it for you. This process can be taught from experienced readers from many modalities, including Chiropractic, chakra work and GEMs (my training). I highly recommend the process as it is an invaluable life tool itself. If you want to talk more, reach out.